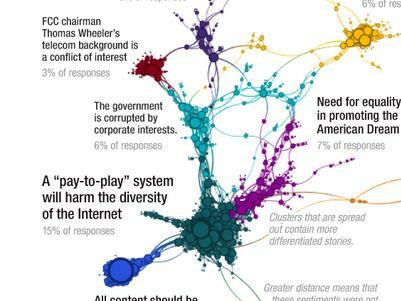 In response to the FCC's policies on net neutrality, the Internet submited over 1.1 million comments. 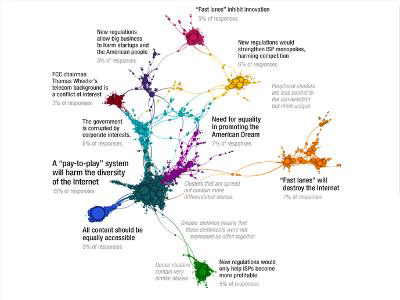 The data analysis firm Quid analyzed the sentiment and arguments of these public comments, parsing hundres of thousands of comments and media coverage to find emergent themes, depicted here via the color-differentiated colors. The closeness of responses indicates co-occurrences, while the density of clusters indicates the similarities of the stories. Edges indicate similar language used across nodes, while nodes bridging clusters indicate stories that span multiple topics.